I hope that you will take the time to read about Eric Harrison from Supplies on the Fly, FE&S' 2018 DSR of the Year (page 40). As many of you know, this award is near and dear to my heart as a former DSR of the Year for ID, a magazine that covered the broadline foodservice distribution space. That award came early in my career and more than a few years ago. One might reasonably ask what relevance the award has in 2018 and my answer is … plenty. Having lived the life of a DSR, I have a unique appreciation for what it takes to be successful in this demanding role. Distributor sales reps serve as the conduit between their companies and their opera- tor customers. Both the distributors and the operators do business in hypercompetitive environments with thin margins. It can be a really tough place to make a living. The ones who do it well are accomplished profession- als who deserve a great deal of respect. Like many in the foodservice industry and, I suspect, many regular readers of FE&S today, I didn't come into this business through the proverbial front door. Quite literally, I came in through the back door. 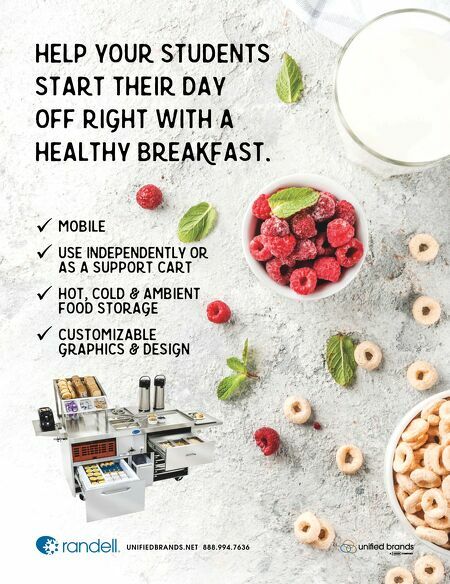 First as a server in high school, a dish room attendant working my way through college, a kitchen manager, an F&B man- ager at a country club and then a DSR for a broadline distributor. It wasn't until my 30s that my career in magazine ad sales began, which took me from a salesperson with FE&S to eventually becoming pub- lisher of the magazine, and now owner and CEO of Zoomba Group. That's my story. What I find particularly compelling about Eric's story is that he operates in a hybrid space that encompasses both the old-school face-to-face relationship building facet of the business coupled with the new reality of internet sales. He really has a fasci- nating story; one that everyone with a stake in this business should read with interest. 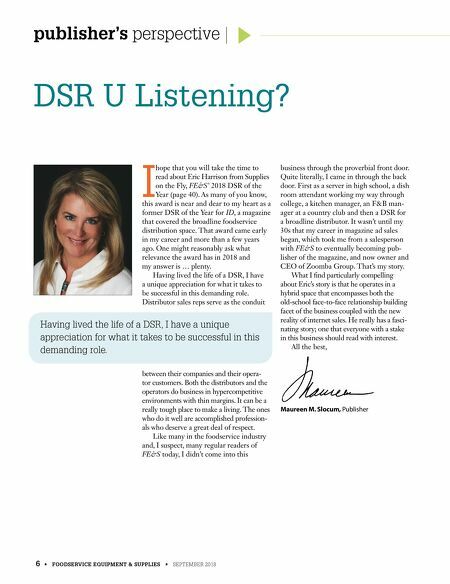 All the best, 6 • FOODSERVICE EQUIPMENT & SUPPLIES • SEPTEMBER 2018 publisher's perspective DSR U Listening? Maureen M. Slocum, Publisher Having lived the life of a DSR, I have a unique appreciation for what it takes to be successful in this demanding role.